Home » Genealogy Resources » Genealogy Talks » Gedcom do not work with other program? Please give advice, I have created file.ged (test.ged - see please bellow) and wanted import to programme Family Tree Maker 16.0 and MyHeritage Family Tree Builder, but those programmes not recognized this format. The default Gedcom export contains a lots of extra information needed by GenoPro (position of each object, colors, etc). 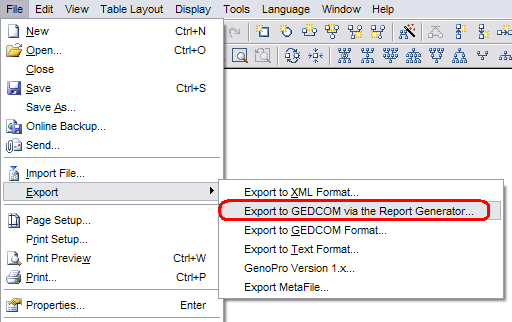 If you want a clean and compatible Gedcom file try exporting a Gedcom file with the report Generator. This Gedcom file will offer maximum compatibility however will have some data loss when re-imported with GenoPro.. I have another question concerning the subject: I need to have coding of GEDCOM in Win1250. This is possible to select in the native Export but there is no option to select codepage when I export GEDCOM via Report generator. By default GenoPro use the UTF-8 encoding when saving files to disk, however you can change it to any valid code page.